Italian fly-half Andrea Marcato has gone some way to filling the void left by Diego Dominguez in the Italian national team. 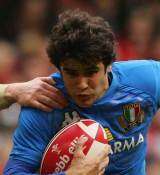 Marcato made his full international debut against Japan in 2006, but was not selected for the 2007 Rugby World Cup under coach Pierre Berbizier. His fortunes changed under new Italy boss Nick Mallett, who selected him in the squad for the 2008 Six Nations. Marcato featured in all five games, but often at fullback as Mallett experimented with Biarritz centre Andrea Masi at fly-half. Marcato provided Italy's best moment of the tournament when his last-minute drop-goal defeated Scotland at the Stadion Flaminio. Mallett selected Marcato for Italy's summer tour in 2008 and after playing in a heavy loss to the Springboks he was again Italy's saviour as he kicked a last-minute penalty to defeat Argentina. Marcato was also a key part of Italy's autumn internationals, but the side experienced a tough time with losses to Australia, Argentina and the Pacific Islands.